sacred architecture. As city expanded, immigrants from all over the world also moved here to call it home. 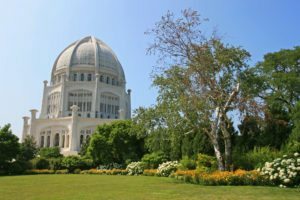 Along with them came religious centers for all faiths and religions, dotting the landscape of great Chicago metropolitan area. Their architecture and diversity is making Chicago even more diverse and beautiful. 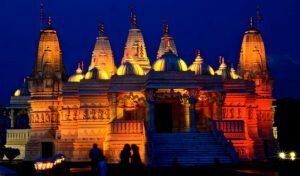 Here are some of the most visited temples of Chicago. 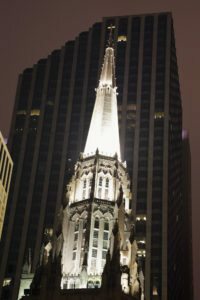 First Union Methodist Church at the Chicago Temple is a congregation with glorious past, a vibrant present and a promising future. It is the oldest church in Chicago! It was founded in 1831, six years before the City of Chicago was incorporated. First United Methodist Church at the Chicago Temple is located in the heart of downtown Chicago, at 77 West Washington Street. It is directly across the street from Daley Plaza and the iconic Picasso sculpture. 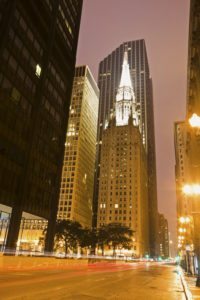 The church is located within easy reach by public transportation and Chicago Transit Authority buses. 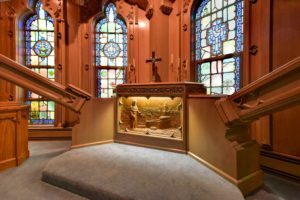 Monday through Saturday at 2 pm the Chicago Temple offers free tours of the “Chicago Chapel in the Sky”. Tours are also available on Sundays after each worship service. 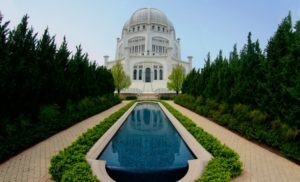 The Bahá’í Temple or Bahai House of Worship in Wilmette, is one of eight dedicated temples of the Bahá’í Faith. 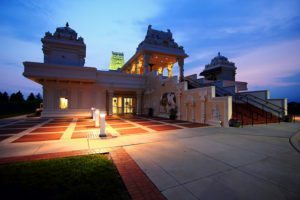 It is the oldest surviving Bahá’í House of Worship in the world, and the only one in the United States. 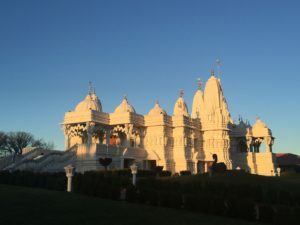 On April 30, 2007, this temple was named one of the Seven Wonders of Illinois by the Illinois Bureau of Tourism representing the Chicago metropolitan area. 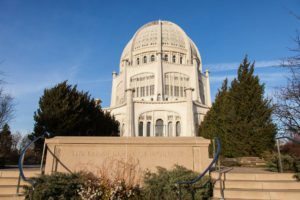 The Wilmette House of Worship is known by Baha’is as the “Mother Temple of the West” and formally as the “Bahá’í House of Worship for the North American Continent”. 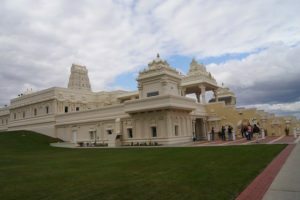 Shri Balaji Temple of Aurora, is a premier Hindu Temple in Aurora, has played significant role in growing list of architectural marvels in Chicagoland. This design is an excellent blend of ancient Shilpa shastra and modern architectural technology. This design also served as a model for other temples that were built later in the United States. A unique feature of the temple is provision for circumambulation inside the temple not only around the presiding deity, but around all the major shrines inside the temple. 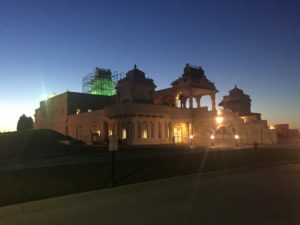 The BAPS Shri Swaminarayan Temple Complex in Bartlett, has become the focus of interest and wonder for thousands of local citizens and people visiting Chicagoland. The fusion of traditional Indian architecture with modern technology has attracted people from all walks of life. From visiting school groups to architects, they are all marveled by the stunning architecture and breathtaking artistry of the temple. 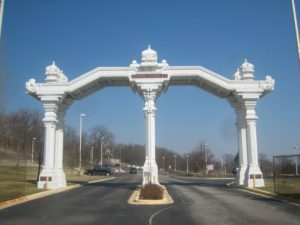 The Hindu Temple of Greater Chicago (HTGC) is a Hindu temple complex in Lemont, Illinois, established in 1977. 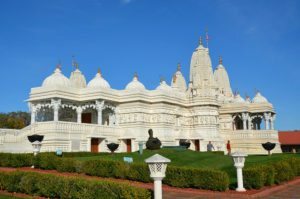 Perched on a wooded hillside above the Des Plaines River valley in Lemont, the temple represents one of the most impressive feats of devotion outside India. This temple was built to specifications in the authentic style of the Chola dynasty. The temple complex consists of four buildings. 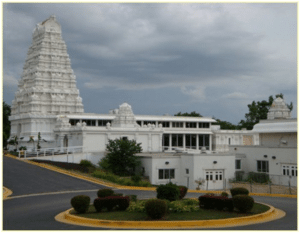 The Rama temple, Ganesha-Shiva-Durga temple a community center connecting the two temples and Vivekananda Spiritual Center. 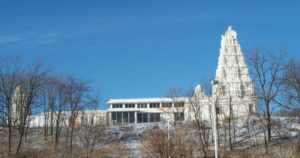 Its magnificent 80-foot tower is a potent symbol of Hindu spirit. There are many other architecture marvels that are of equally importance and we will cover them in next post. Till then lets enjoy the diversity, inclusion and community service these places of worship bring to our city of joy, Chicago. I have been to aurora and Bartlett temple, thanks for putting them all together. Nice pictures ! Nice pics !! Is there a ISCON temple also in Chicago ? Good info. Lucky me I recently found your website by accident (stumbleupon). I have bookmarked it for later!